Nancy Leigh DeMoss: Every four years here in the United States we have something that is called an inauguration. It's an official, public ceremony in which the President takes the oath of office in front of a large crowd of spectators. The inauguration marks the beginning of the leader's term of office. That's the point at which he assumes his office or position of authority or power. Leslie Basham: That's Nancy Leigh DeMoss turning our attention to important moments that mark beginnings. Nancy: Then, thinking of another kind of service, a few weeks ago I had the privilege of attending an ordination service for a young man who was being set apart by his church for gospel ministry. In this service he was publicly affirmed as a pastor, as an elder, and he was charged to faithfully fulfill his calling to ministry. Over these last several days, we've looked at Jesus’ life and His work before coming to this earth. We've looked at His incarnation, childhood, youth, His young adulthood, His working life as a carpenter and as a builder. Today, we want to look at an event that was in a sense His inauguration or His ordination. There are similarities in those ceremonies in what we're going to see today. This was a public ceremony that marked the end of His private life and inaugurated or launched His public, earthly ministry. Leslie: This is Revive Our Hearts with Nancy Leigh DeMoss for Friday, February 27, 2015. Nancy: Now during these weeks leading up to Passion Week and Easter week, we are looking at a portrait of "The Incomparable Christ." We're following along with the themes in this book called The Incomparable Christ by Oswald Sanders in a special edition of that book produced by Moody Publishers for Revive Our Hearts. Many of you are following along with that book. Today, we're looking at chapter 7 on the baptism of Christ—another glimpse of the incomparable Christ. Now, every time a believer is baptized, it is a momentous occasion. 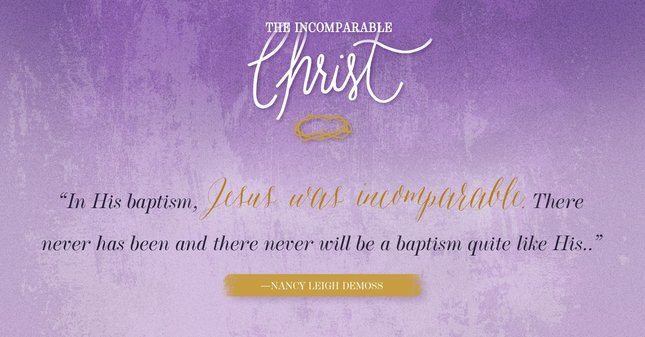 But in His baptism, Jesus was incomparable. There never has been and there never will be a baptism quite like His. Let me ask you to turn in the Gospel of Matthew to chapter 3, the first book of the New Testament. “In those days John the Baptist came preaching in the wilderness of Judea, 'Repent, for the kingdom of heaven is at hand'” (vv. 1–2). So John sent to announce the coming of the kingdom of heaven and the coming of the King whose kingdom it is. “Then Jerusalem and all Judea and all the region about the Jordan were going out to him, and they were baptized by him in the river Jordan, confessing their sins” (vv. 5–6). Baptism is a rite, a ceremony that signified washing, cleansing from sin. These people that came to be baptized were publicly acknowledging that they were sinners, who needed to be cleansed. They were casting themselves on the mercy of God, realizing they could not save themselves. Baptism did not save them, but it was a visible expression of a work that had been done in their hearts, a work that they Bible calls repentance. Now, these were believers who were being baptized before Jesus had died on the cross. So this was a transition period as they were looking forward in faith, to what we now look backward on in faith to the forgiveness and the deliverance that Christ would bring. As Christ died on the cross, we look back and see the deliverance and the forgiveness from our sins. That's why we confess to Him, not to any person to forgive us from our sins, but to God who alone can forgive sins. So in being baptized, these people were confessing their sins, they were looking forward to the coming of Christ, and they were declaring their loyalty to the kingdom of heaven. We are followers of Christ, the King. They didn’t know as much about Christ. They knew very little about Christ. They knew what was foreshadowed in the Old Testament. But they were seeing obscurely and looking for Christ and His coming. We know so much more about Him. We look back and rejoice in the fact that He has come. In baptism we declare our loyalty to Christ the King and to His kingdom. In verses 7–10 the Pharisees and the Sadducees, the religious rulers, come to where John is baptizing. One might expect that John would have been thrilled to see them coming. "Wow. They are embracing my ministry. They think this is important. They've taken time out of their busy schedules to come to the services I'm having here in the Judean wilderness." But instead, John publicly rebukes them, and it is a very stiff rebuke, for their lack of true heart repentance. He warns them that their spiritual pedigrees and their religious performances are meaningless if their hearts have not been changed. He warns them that all who are not truly repentant, no matter what their title is: Reverend so-and-so, Pharisee so-and-so, no matter what their title is, no matter what their seminary education may have been, no matter how much respect other people have for them, he warns them that anyone who is not truly repentant in his heart will face eternal judgment and the wrath of God. Then, having warned them, he points them and the whole crowd to Christ. We pick up at Matthew 3:11. He says, “I baptize you with water for repentance, but he who is coming after me is mightier than I, whose sandals I am not worthy to carry. He will baptize you with the Holy Spirit and fire. His winnowing fork is in his hand, and he will clear his threshing floor and gather his wheat into the barn, but the chaff he will burn with unquenchable fire” (vv. 11–12). Now that's a whole text we could spend a lot of time on. We won't because I want to get to the baptism. But he's essentially saying that Christ is going to separate those who belong to Him from those who don’t. The one will go to eternal salvation, the other to eternal damnation and judgment. “But Jesus answered him, 'Let it be so now, for thus it is fitting for us to fulfill all righteousness.' Then he consented” (v. 15). In this passage we see again the humility of Christ. You will see His humility from His birth, through His life, through His death, all the way through the gospels you see the humbling of Christ. The Son of God, the King of glory, the King of the kingdom heaven. Here he comes. He is sinless. He has no need for repentance. He submits to the baptism of repentance. It reminds me of Isaiah 53, that wonderful passage about the suffering of Christ. It say he “was numbered [or counted] with the transgressors.” Let me be baptized. He identified with sinners, with those He came to save. He's a humble Savior. That's what made Him fit to be our Savior, that He was willing to identify with us as sinners. We see the obedience of Christ. Not just humility, but His obedience. He said, “It is fitting for us to fulfill all righteousness.” Christ perfectly fulfilled the whole law of God and all the will of His heavenly Father. Has anybody ever done that? Not a person ever. I don't care how religious they are, how respected they are, how up they are in their religious system. No one other than Christ has ever fulfilled the will of God. He is incomparable. The good news of the gospel is that His righteous, obedient life can be counted to our credit. The theologians used the term “imputed.” His righteousness can be counted as ours. That's what it means to be justified. To be counted righteous—not because we are righteous—but because the righteousness of Christ has been credited to our account. That's why it was fitting for Him to fulfill all righteousness, otherwise He could not have justified us as sinners. He could not have made us righteous. Romans 8 says, “By sending his own Son in the likeness of sinful flesh and for sin, [God] condemned sin in the flesh, in order that the righteous requirement of the law might be fulfilled in us” (vv. 3–4). The righteousness of God can be fulfilled in us because Jesus fulfilled all righteousness. It leads me to ask is there any area of righteousness that you have not fulfilled? It could even be in this area of baptism. We see a pattern and teaching in Scripture that those who have come to place their faith in Jesus Christ are to signify that by going through the waters of baptism. Baptism will not save you. It will not make you more spiritual. In fact, if it's not an outward expression of an inward reality, all it's doing is getting wet. But if your heart has been changed, if you believe in Christ to save you, you've repented of your sin, then to be baptized is an act of obedience. Jesus said it is fitting for us to fulfill all righteousness. I wonder if there aren’t listening today that one simple act of obedience that you never fulfilled is this matter of being baptized subsequent to your coming to faith in Jesus Christ. Back to Matthew 3:16, “And when Jesus was baptized, immediately he went up from the water.” We have in this baptism of Christ, this powerful picture that I have been grappling with over these past days. I find that I struggle to find words to express what all is symbolized in the baptism of Christ. It's a picture of what happens to us when we come in to Christ. We are joined with Him in His death, and then with Him in His resurrection. We go down an old creature, and we come up a new creature. Not in the physical waters of baptism. The physical waters of baptism symbolize what has happened to us spiritually as we have been buried with Christ in the likeness of His death, and raised with Him in the likeness of His resurrection. Jesus' baptism is a fulfillment of something else. It's a fulfillment of Old Testament picture that has to do with the priests. The Old Testament priests began their ministry at age thirty. How old was Jesus when He was baptized? About thirty. The priests would be ceremonially washed with water. Jesus is fulfilling that type because He is our great High Priest. In Leviticus 8 you have a lengthy description of the first time that Aaron, who was the first High Priest, and his sons who were also priests were consecrated, or set apart for ministry. When this took place, the whole congregation gathered together for a public ceremony. Let me read just a few verses out of Leviticus 8, “And Moses brought Aaron and his sons and washed them with water. And he put the coat on him and tied the sash around his waist and clothed him . . . And he poured some of the anointing oil on Aaron’s head and anointed him to consecrate him” (vv. 6–7, 12). The priests were washed with water, they were clothed with special garments on them, and then the High Priest alone was anointed with oil. Now oil in the Scripture is often a picture of the Holy Spirit—a divine enabling for service. Jesus fulfilled that Old Testament type as He goes into the waters of baptism, picturing a washing of water—although He had no sin of His own to be washed away—a clothing with the power of God, and being anointed with the oil of the Holy Spirit as He launches into His public ministry. You see that as you continue on in this text in Matthew 3. What happens after Jesus comes out of the water of baptism? “And behold, the heavens were opened to him, and he saw the Spirit of God descending like a dove and coming to rest on him; and behold, a voice from heaven said, 'This is my beloved Son, with whom I am well pleased'” (vv. 16–17). Now it's clear that Jesus was not just another man being baptized. He is the incomparable Christ. John knew it. The bystanders that day that heard that voice from heaven, they knew it. The angels knew it. We know it as we're reading it. This is not just another man being baptized. So, let's unpack the three things that took place as Jesus came out of the waters of baptism. The heavens were opened to him. The Spirit of God descended like a dove and rested on Him. The Father spoke from heaven. Let's look at each of those for a moment here. First, the heavens were opened to Him. By the way, in the parallel account of Jesus' baptism in Luke 3, it gives us one little detail that we don't see in Matthew's gospel. It says, “When Jesus had been baptized and was praying, the heavens were opened” (v. 21). Jesus is in communion with His Father. He's praying. He is using the means of grace. Intimacy with God comes as we use the means of grace God has made available to us. You think about the heavens being opened to Jesus. Because of sin—ever since Genesis 3 when Adam and Eve were sent out of the garden of Eden and the way was barred for them ever to come back into that earthly paradise—from that point to this current day, access to the presence of God in heaven has been closed to mankind. None of us on our own can make it into the presence of God, can make it into heaven, can enjoy the companionship and fellowship with God that we were created to enjoy. Heaven is closed to us because of our sin that has separated us from God. But Jesus, the incomparable Christ, has access to the presence of God, to the throne room of heaven. Why? By virtue of His sinless life. He has never sinned. He has never once disobeyed His Father, never once resisted His Father's will. He has constant open access right to the throne room of God, to the very presence of God. Here's what I love about this. Jesus came to this earth so that heaven could be opened to us, so we could be granted access to God’s presence! Ladies, do you know what that means? All the religions of the world in essence are people trying to get to God in their own works, their own efforts, their own striving, their own struggling, their own religion. The way is barred. Heaven is closed. Jesus said, “I am the way, the truth, and the life. No one comes to the Father but through me” (John 14:6). There is no other way—only through Christ. Because He came to this earth and not only lived a sinless life, but died the death that sinners deserve to die, because He died as a substitute in our place, the heavens are opened to us. Remember when Stephen was martyred, the first Christian martyr there in the book of Acts chapter 7? What did he see? As he was going to die, he said, "Behold, I see the heavens opened, and the Son of Man standing at the right hand of God" (v. 56). Stephen never could have said that. You and I could never have said that if the Son of Man, the Son of God, had not come to this earth, fulfilled all righteousness, and died our death so that the heavens could be opened for us. Access to the Father. I love that verse in Revelation 4:1 when John is getting that vision of what is going on up in heaven. He says, “After this I looked, and behold, a door standing open in heaven! And the first voice, which I had heard speaking to me like a trumpet, said, 'Come up here. '” It could have never been said, heaven would not have been opened, the door would have been barred forever, God would have never said, “Come up here to My place and live with Me forever” if Jesus had not come down here and lived a sinless life and died our death. Some of you have been in church all of your life, you've been religious all your life, or maybe this is all new to you but you've never grasped the fact that heaven is open only to those who go by way of Jesus. He's opened that way for us through His cross. Are you grateful? Is that not incredible—that heaven is open to us? Not because we're good, not because we perform, not because we jump through hoops, but because Jesus has died for our sin. Number 2, the Spirit of God descended like a dove and rested on Him. It reminds me of that verse in Isaiah 61 that says, “The Spirit of the Lord GOD is upon me, because the LORD has anointed me to bring good news to the poor” (v. 1). Jesus came to this earth and the fullness of the Holy Spirit was anointed for service, anointed to proclaim the gospel, anointed to bring the good news to those who were destitute and desperately needed a savior. How did He do it? The Spirit of God was upon Him. In fact, after His baptism, after this anointing of the Holy Spirit for service, after this inauguration into ministry, Scripture tells us in Luke 4:1, “And Jesus, full of the Holy Spirit, returned from the Jordan and was led by the Spirit,” and He goes on into His earthly ministry. Though Jesus was God, throughout His entire earthly life, as a man, He exercised dependence upon the Holy Spirit, and so must we. You and I cannot do what God has called us to do—whatever that is. You can wash dishes, you can have kids, you can work at your job, but you can't do it in a way that is spiritually effective for the glory of God unless you do it with the power of the Holy Spirit. The neat thing is that He has given His Spirit to us to empower us for service. Not only does the Holy Spirit come upon us, but if you are a child of God, the Scripture says the Spirit of Jesus lives in you. There is power for serving God and others because of the ministry of the Holy Spirit. God was satisfied with His Son who was fully obedient, pure, sinless, who fulfilled all God’s commandments, including the first two, to love the Lord God and to love others. He fulfilled those commandments perfectly. Jesus would make an acceptable sacrifice for our sin, become our substitute, die in our place, and God would accept that sacrifice. Because this was His beloved Son with whom He was well pleased. So we have in Jesus' baptism the inauguration of His public ministry. He goes forth in the power of the Spirit and with the assurance His life, His sacrifice, His offering up of Himself is acceptable, is satisfying, and pleasing to His Father. Just two comments as we close here. “This is my beloved Son,” God said of Jesus. Because of Jesus’ obedient life and His sacrificial death on our behalf, we can be sons and daughters of God, experience the Father’s love, and be accepted by Him. In fact, 1 John 3:1 says, “See what kind of love the Father has given to us, that we should be called children of God; and so we are.” So God said, “This is my beloved Son.” If we are in Christ, what does He say of us? “You are my beloved daughter. You are my beloved child.” Jesus came so that we could have that relationship with God. “This is my beloved Son with whom I am well pleased.” The thought crosses my mind that if God was pleased and delighted with His Son, what should be our view of the Son? Are you delighted with Him? Are you pleased with Him? Can you say, “He is my beloved Savior, and with Him I am well satisfied. I am well pleased”? Leslie: Have you ever thought much about the baptism of Jesus? Nancy Leigh DeMoss has given us a lot to think about regarding this inauguration of Jesus' ministry. That message is part of the series "The Incomparable Christ." Throughout the series, Nancy is considering important aspects of the life of Jesus. You may discover that you've never considered some of these topics before. To hear all of the messages that have aired so far in this series, visit ReviveOurHearts.com. Nancy is following an outline from the book The Incomparable Christ by J Oswald Sanders. The book made a big impression on Nancy in the weeks leading up to the Passion Week. She wanted to share the book with our listeners. Moody Publishers has created a special Revive Our Hearts edition of the book. We’ll send you a copy when you donate any amount to the ministry of Revive Our Hearts. You’ll also get the companion journal. It will help you follow this teaching up and take practical steps based on what you’ve learned. We’d love to send one book and journal set per household for your donation of any amount. Just call us at 1–800–569–5959, or visit ReviveOurHearts.com. Well, imagine you're alone in a barren wilderness, surrounded by wild animals. You haven't eaten in forty days. Do you think you'd be vulnerable to temptation in a case like that? Find out how Jesus handled the pressure of the situation when Revive Our Hearts returns on Monday. All Scripture is taken from the English Standard Version.